The missing link between sales, marketing, reporting, and analysis is no longer missing. Search Optics is your one-stop shop for all metrics tracking and digital analysis. Our proprietary set of tools measures campaigns at a highly detailed level, allowing for granular assessment of performance. Search Optics is the exclusive provider of UPTRACS to the automotive industry. 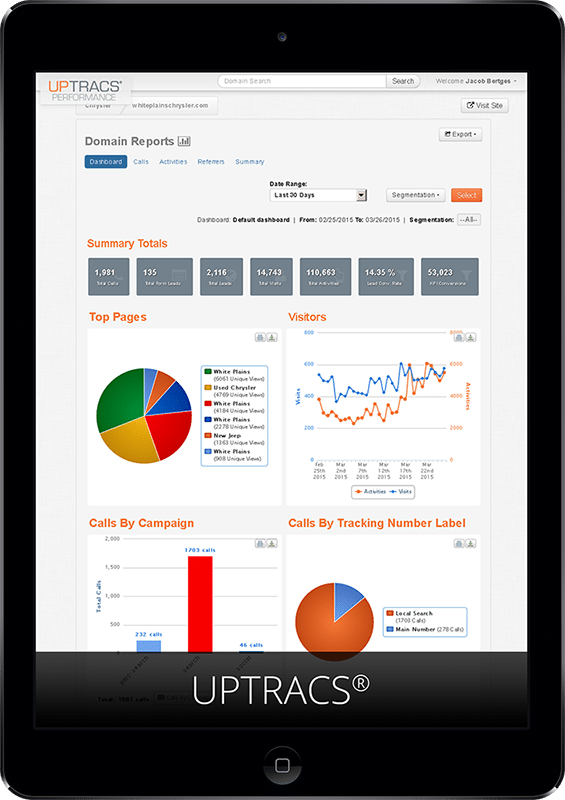 UPTRACS is a reporting platform that measures the effectiveness of each marketing dollar you spend and helps you to optimise your entire campaign – not only by tracking every response to your online marketing efforts but by also calculating your offline conversion rates and cost-per-lead – all in real-time. This information gives you the confidence to make critical decisions about how to adjust your digital strategy for maximum returns. Real-time measurements – UPTRACS monitors your campaigns and provides performance reporting 24/7. User-friendly dashboards – Our platform generates reports that are intuitive, easy to read, and actionable. Built-in call log – This feature comes standard, with optional recording functionality to keep track of prospects. Conversion data – Using UPTRACS, you can calculate offline conversion rates for phone calls, e-mails, and forms. Customisable – Our proprietary technology allows for customised KPI implementation and tracking. Accessible – Responsive reports can be accessed anywhere and anytime from any device, including mobile. Tired of wasting money on marketing with no proof of return? Eliminate the guesswork with our solutions. Opt-in for company updates and new product offerings Subscribe to company updates and new product offerings from Search Optics.